"Use a candy thermometer for best results in making this quick recipe for caramel cake icing that goes well with chopped nuts." Combine in a saucepan the brown sugar, salt, butter or margarine and milk. Cook, stirring until sugar is dissolved. Then cook without stirring until mixture forms a soft ball when a little is dropped in cold water (234 degrees F - 115 degrees C). Cool to lukewarm (110 degrees F). Put into small bowl and beat until it begins to thicken. Add vanilla and cream and continue beating until of spreading consistency. If thicker consistency is desired, beat in a small amount of sifted confectioners' sugar. Quickly spread on cake. Sprinkle with chopped nuts if desired. Enough to frost two 8 inch layers. 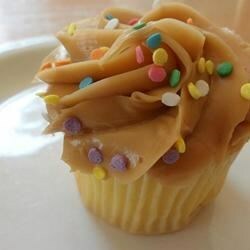 This is a very tasty caramel frosting. I did add 1/4 cup of powdered sugar. The recipe didn't state how much to add, but this amount seemed sufficient. This recipe is extremely misleading. This make a glaze or a drizzle, not a fluffy frosting as the photo implies. Bad adverstising! I put this icing over caramel cookie bars I make :3 My fiance's family loves when I make them! Good flavor but very thin consistency. Definitely not as pictured. Omit the extra cream and add powdered sugar. This was great! I opted not to add the powdered sugar and used this as more of a sauce/drizzle. Very good flavor and consistency! Will make again. Very runny, never got thick and creamy. Made this recipe twice. Turned out great both times, even though it was only my first and second times making caramel frosting in my life! If I can do it, you can too!